Isibindi Zulu Lodge offers superb KwaZulu-Natal battlefields accommodation and first class service with an emphasis on quality. Experience the Zulu culture in South Africa. Located in a private game reserve in the heart of KwaZulu-Natal, Isibindi Zulu Lodge rises magestically from the rugged bushveld and is the ideal place from which to enjoy an exhilarating cultural experience. The exclusive 12-bed lodge is an architectural celebration of the Zulu nation and is on the doorstep of the Anglo-Zulu battlefields of Rorke's Drift and Isandlwana. Enjoy morning or evening game drives in the Isibindi Eco-Reserve, visit a traditional Zulu homestead, or for the more adventurous tackle the mighty Buffalo River and go on a white-water rafting adventure. 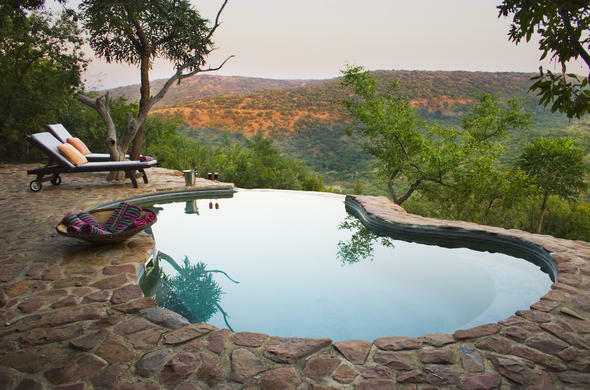 Isibindi Zulu Lodge is situated in a private game reserve in the ruggedly beautiful Zululand. An architectural celebration of the Zulu nation, the lodge is a peaceful bushveld (open fields) retreat which also offers a host of activities for guests wanting to experience a combination of luxurious accommodation, game viewing, battlefields and Zulu cultural experiences. Isibindi Zulu Lodge offers the rare opportunity of learning about the Zulu culture and traditions as they remain in Zululand today. A Zulu cultural evening begins just as the sun starts setting, casting the hills in soft golden light. Guests are led down a narrow path to the beat of drums. As one emerges into a clearing coming across a historical Zulu umuzi (homestead) the dancing bodies of Zulu men and women make for a profound experience. The traditional dances and their role in Zulu history and culture is explained amid the energetic displays.